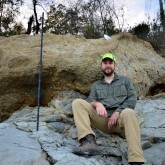 My research focuses on understanding major mass extinctions in earth history by employing multiple geologic skillsets to the same field area and questions. My work has primarily involved stable isotope geochemistry and paleontology, in addition to a component of magnetostratigraphic analysis. Field work is an essential component of my studies, and my current field sites are on the Antarctic Peninsula and in eastern Montana focusing on the end Cretaceous mass extinction.